Joint cartilage is the smooth substance that covers the ends of the bones in the joint. Is is a highly specialised tissue which allows a healthy knee to move with virtually no friction. Unfortunately, the intricate structure that confers such smooth movement is very difficult to repair once damaged. Symptoms of cartilage damage include pain and recurrent swelling. The swelling is thought to be caused by movement abrading tiny particles of cartilage from the injured site. These then cause irritation of the joint lining (synovium) whioch responds by producing excess joint fluid. Non-operative treatment will depend on the location of the damage within the knee and the knee's overall alignment. Injections can be used to reduce inflammation associated with the cartilage damage and this may suffice in many cases. However, surgical intervantion may be necessary to attempt to either repair the cartilage damage or shift load onto a healthy area. Cartilage surgery involves taking away damaged cartilage where this is catching and causing swelling. Several different types of procedure are available to attempt to restore the joint surface, each with its own advantages and disadvantages. The simplest procedure is to stimulate the area of injury to repair itself. This can be achieved by Bone Marrow Stimulation, where small tracks are formed in the bone underlying the damaged area. The resultant blood clot matures into a stable surface. 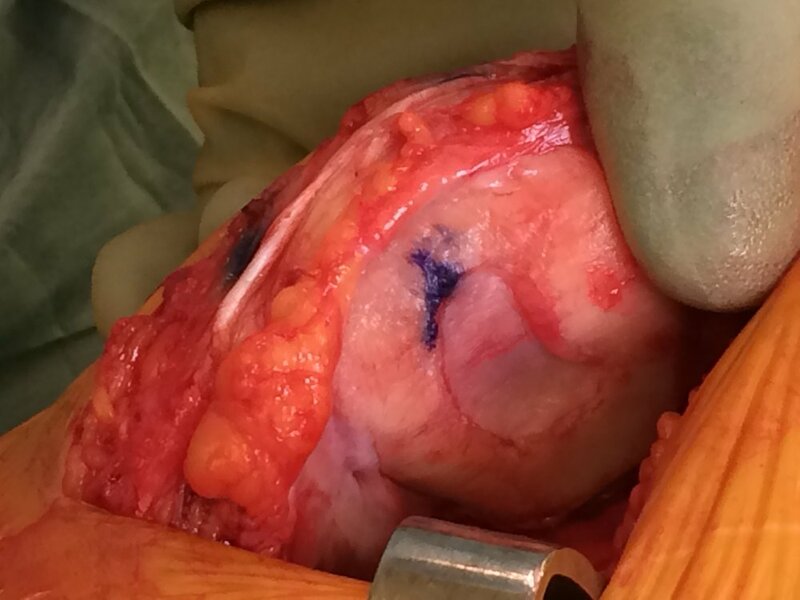 Alternatively, a staged procedure can be used to harvest healthy cartilage from your knee, grow the cells in a laboratory and then re-implant then at a second procedure. This type of surgery is perhaps more successful at producing durable cartilage but is very expensive, restricting its use. Other types of surgery exist, from taking bone and cartilage plugs from a different area of your knee to implant into the defect to using small artificial implants. Overall, the success of surgery will depend on the quality of the repair tissue and the knee's alignment. An osteotomy may be advised in cases where the alignment is found to be unfavourable.